Tis the season for giving! 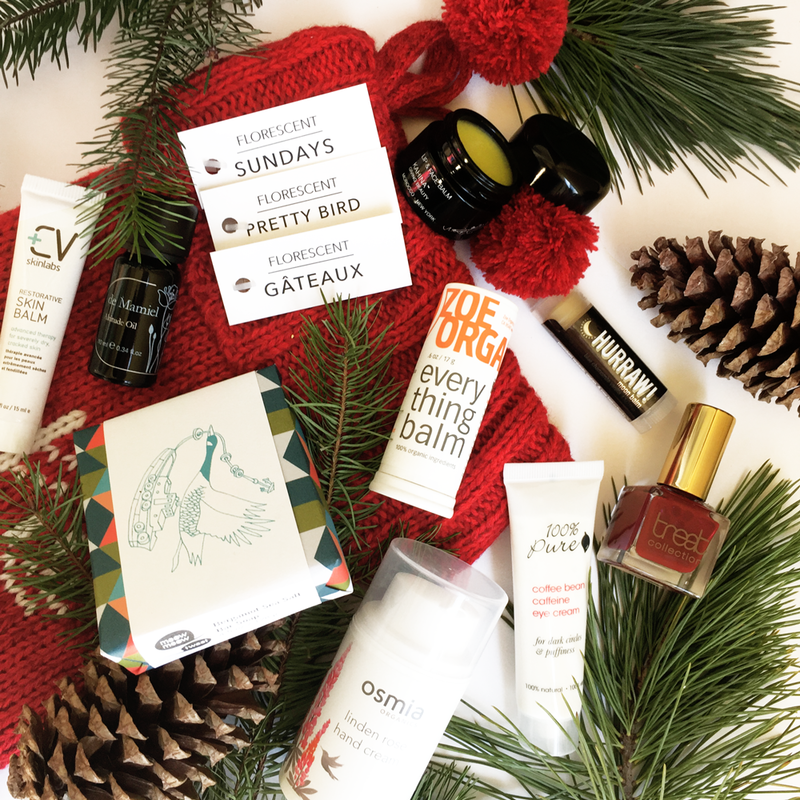 Welcome to the quintessential list of stocking stuffers under $50 for green beauty enthusiasts. Of course, your gift recipients don’t have to be as crazy about ingredient safety and quality as you are—but this is your chance to show your loved ones there’s something to this world of botanical products after all! Stockings are a great opportunity to share treats that are both practical yet fun and festive. These are our picks for the top 10 stocking stuffers under $50, so go ahead and fill those stockings with nontoxic merriment! 1. HURRAW! Lip Balms — The quintessential stocking stuffer just happens to be one of the best lip balms on the face of this earth. Fun yet 100% effective and vegan (no beeswax! ), HURRAW! lip balms are as collectible as it gets. Grab a few flavors. 2. Treat Collection — This 5-free and cruelty free line of nail polish comes in a dazzling array of colors that help express your personal style and put the finishing touch on the most casual look. Art House, a sultry deep burgundy, and Black Tie, the perfect red, are especially seasonal. 3. Meow Meow Tweet Soaps — It’s true, Meow Meow Tweet made a soap lover out of me. You can make soap dreams come true for your loved ones when you add these nourishing and festive beauties to stockings. Bonus: the paper wrapping is gift worthy alone. 4. Zoe Organics Everything Balm — For moms, kids or anyone who needs a gentle all-purpose moisturizer on the go. Easy to apply and mess free yet healing and effective, the Everything Balm is a must-have for handbags and backpacks. 5. 100% Pure Coffee Bean Eye Cream — Talk about bang for your buck! This rich and gentle eye cream instantly relieves puffiness and helps minimize dark circles and fine lines. Full of antioxidants like caffeine-rich coffee cherry and green tea, this formula helps the under-eye area look awake and rested. 6. Osmia Hand Creams — If you’ve ever longed for a hand cream that is rich enough to heal cracked hands but absorbs quickly (almost instantly! ), look no further. Give Osmia’s hand creams in stockings this year in two delicious flavors—Linden Rose and Vanilla Shea. You’ll be the new favorite relative. 7. Florescent Sample Kit — Love the idea of gifting perfume but not sure you’d pick the right one? Let your loved ones experience the three botanical perfumes from Florescent and decide for themselves which unique fragrance is the one. 8. De Mamiel Altitude Oil — This can’t live without it aromatherapy treatment is perfect for your relatives that travel a lot or are exposed to the public everyday (think school teachers, hospital workers, etc.). It’s an immune boosting remedy that relieves stress and fatigue, too. Brilliant! 9. Kahina Lip & Face Balm — This is the grown-up version of the Everything Balm, with its super protective and healing properties and gentle geranium and neroli scent—nobody can resist this little glass pot of botanical goodness. Treat your favorites to their new favorite. 10. CV Skinlab Restorative Balm — This little dream is your first aid kit in a tube. The petroleum-free salve is blended with a powerful set of anti-inflammatory ingredients that soothe and repair. A real curative for chaffed and chapped skin, including breast-feeding moms. What would you love to see in your stocking this year?